Invisible dangers - From medical waste to live viruses, any business that deals with biohazardous materials knows that these represent a very real danger to both employees and visitors on their premises. In order to help maintain the best safety standards at your workplace, ensure you use biohazard signs at any location where such materials may be present. By using prominently displayed signs you can help to make sure that everyone in the area understands the risks and can take the appropriate actions needed to protect them from the danger. 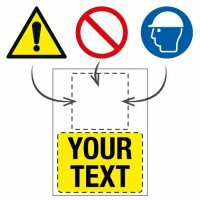 All of our safety signs meet current legislation and are available in a range of size and material options, meaning you can be sure to find exactly what you need to keep your people safe. For more inforamtion take a look at our buying guide. 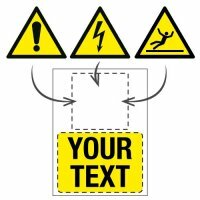 The prevention of accidents before they occur is the ultimate goal of any good health and safety program and well-placed, appropriate safety signs help to ensure just that. However, you should always be prepared should the worst happen. As well as safety signs, we can provide your business with any other equipment that is needed to protect employees and visitors from biohazards. Protecting your team - Our biohazard signs may warn people to keep their distance, but they may also instruct employees to wear suitable protective clothing. We have a large selection of Personal Protective Equipment, including Eye Protection, Safety Gloves and Respiratory Equipment. Furthermore, it is essential that in the event of an accident involving hazardous materials that prompt treatment can be offered. Use our Emergency Facilities Signs so that Eye Washes and Safety Showerscan be quickly located in an emergency. It is also imperative to make areas safe as quickly as possible in the event of an accident. Browse our range of Biohazard and Bodily Fluid Equipment, including our First Aid/BiohazardSafety Stations and see what we can offer your business. Anyone entering premises where biohazardous waste is produced or stored needs to understand that they are potentially coming into danger. By displaying biohazard signs wherever necessary, you can make sure that your team carry out their tasks in the full understanding of where they need to take extra steps to keep themselves safe. The EU and UK rules governing health and safety around biohazardous materials can be bewildering. However, you can shop with confidence at Seton; all of our biohazard signs fully comply with all current health and safety rules including the use of the universally recognised biohazard symbol which meets the European Normative BS EN ISO 7010 legislation. This means that even for those who cannot read the accompanying text - the message is clear. The choice is yours - we stock a large number of biohazard signs each available in our wide range of materials, sizes and orientations to suit every requirement. All of our options are fully compliant with current industry regulations and made of durable materials. Furthermore, you can ensure your signs are placed exactly where they are needed, indoors or out, with our Sign Fixings, helping you keep your signs secured prominently and safely in place. These options include flexible, self-adhesive vinyl signs that lend themselves easily to placing around cylinders.